Parcels arrive safe and sound and wow, beautiful job! Optics look great and it looks great in our lounge (see enclosed photos). Anyway thanks for a great job done. Just love them and so does everyone who looks. Any before photos would be appreciated to show how good your work is to those that ask. Oh and the packing was fantastic. Nice job all round.Thank you. Very much appreciated. The product was just as beautiful as was depicted! He responded to my inquiries immediately and provided confidence about the international shipping. One of the parts was damaged upon arrival and he immediately replaced it. I would absolutely purchase from him again! Neil is very trustworthy and honest! 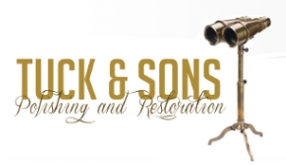 "I can't say enough about what a positive experience I had in buying a set of WWII binoculars from Neil Tuck. Although our time zones are off by about 8 hours (I'm in California), he always responded promptly to my emails and he was very accommodating in scheduling times for us to talk on the phone. He sent lots of photos of the binoculars we were buying, and when they arrived, they were more beautiful than shown in the photos. And all the parts of the binoculars work perfectly. They are very cool, and everyone who visits us comments about how much they like them. I plan to buy a second set of binoculars from Neil for my oldest son very soon." My husband and I purchased a pair of 15x80 Fuji Meibo binoculars at an auction in England. We were fortunate to come across Neil's website and had them sent to him for refurbishment and polish. Neil was on holidays when I contacted him but very kindly responded to my email. We sent the binoculars on and were so pleased we did. Neil was so efficient and professional in all our dealings with him. He sourced shipping for us too and our binoculars arrived promptly. He did an outstanding job. We live on the coast and will enjoy using them however Neil has made them into such a stunning piece that we enjoy just looking at them! Many thanks Neil for everything. Many thanks Neil for the brilliant WW2 Flak Binocs. Really appreciated your advice and guidance. Superb service all round including the excellent packing and speedy delivery. Certainly recommend to others. Hi Neil, arrived safely this morning, they have pride of place in our sitting room. Wonderful!! Really appreciate all your help, they are absolutely stunning. I commissioned Neil Tuck to source and fully restore a set of World War 2 10 X 80 FlakGlas binoculars. I had the opportunity to inspect them at his workshop prior to work commencing and learnt from Neil much of their origins and history. I returned two weeks later and I was delighted to see the transformation that Neil had achieved. They were in pristine condition, highly polished and in full working order. Neil had mounted them on an original wooden Zeiss tripod which he had also restored and French polished. I could not have been more pleased with them and would have no hesitation in recommending Neil to anyone interested in acquiring a similar product. I have just received the TZK Binoculars and I can only describe them as being outstanding. The restoration and quality of finish is excellent and clarity of the optics has far exceeded what I expected. I can’t even imagine the amount of hours that has gone into the restoration process. All my life I have lived in suburbia in Sydney and the view from my back door has been either of a timber pailing or colorbond fence. I am now retiring and moving to a country area where my view is of a Lake, Black Swans, Ducks and various other birds. What you have provided me with will add an extra dimension to my life and I Thank You very much. All the best to you and your family for Christmas and the New Year. I meant to get back to you earlier regarding your packages arriving perfectly on time and as promised. Last night, my family presented the glasses to my father in law for his 70th birthday and they were received with amazement and great happiness. The glasses were even better in person than on your site! Absolutely fantastic. My wife groused that they were much more beautiful than our olive green Russian border guard glasses (with yellow russian lenses)! So there may be another purchase in our future to bring some more of old Germany to the United States. The glasses were packed very well, and the bonus foot rings will save the hardwood floors. Thank you for that. I need to fabricate something similar for our Russian monster (currently using rubber sofa sliders). Many thanks and I look forward to doing business with you again in the near future! Hi Neil, Chris, Got the knife back yesterday and I'd just like to say thanks. It's way better than I'd hoped for. picture with the panel refitted. Again many thanks, Best regards, Peter Jones.